Last week I rode around Bondi with a club-mate who, in all seriousness, must’ve had the noisiest brakes since Fausto Coppi was a boy. No need to look back when Lee was slowing down at the traffic lights; it sounded like there was a B-double on my tail. However, having just returned from a very pleasant morning’s jaunt up to Bobbin Head (just north of Sydney) and back, I can report coming across something even noisier: cicadas. Not sure if it’s insect mating season or not, but thousands upon thousands of the raucous little buggers were out in force today and without hint of exaggeration it was hard to hear yourself think at some points, truly ear-splitting. Hauling my way up the climbs, I can’t recall Mother Nature ever being quite so boisterous before. Had I had a pair in my rear pocket, I would quite gladly have used earplugs because it sounded like they were holding their New Year’s Party a couple of days late; more racket than a house full of inebriated teenagers at Schoolies. Just when I thought I’d seen it all, Mother Nature continues to surprise…gotta love cycling, huh? They’re in fine voice at the moment. Up at Akuna they were earsplitting and down towards Otford the other day it was almost painful. 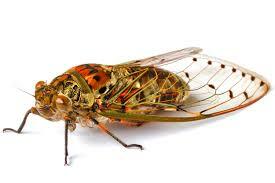 Recently discovered the “Cicada Rain”. Thought for ages it was a slight rain drizzle little did I know it was cicada pee!